In 2009 it was announced that a sculpture of 3 figures (a group of newspapermen) had been relocated to a City garden after being unceremoniously removed from its original home in New Street Square. 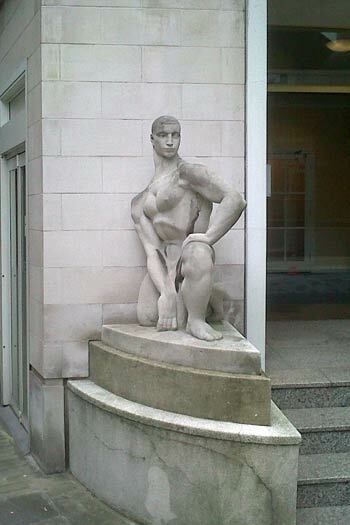 This sculpture dated from 1956/8 and was by the sculptor Wilfred Dudeney. Less remarked upon was the fact that a related piece, a Figure of Youth, remained in situ at the entrance to Pemberton House, facing East Harding Street. This is of slightly earlier date (1955).